We had an international exchange program with 24 students at St. Augustine's College in Australia on April 15(M). 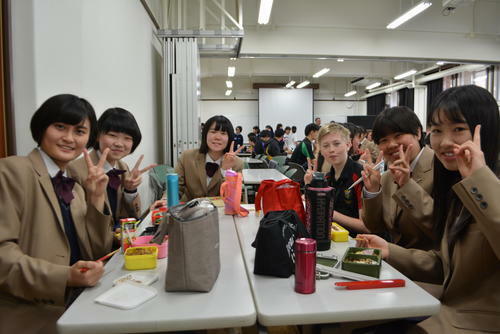 In the second period, we offered a tour of school buildings of our school, so that Australian students would see what our school is like. In the third period, the second year Global Course students (Class 2-7 and 2-8) provided Australian delegation with a welcoming ceremony, in which Mr. Yamano, School Principal, gave a welcome speech; we exchanged commemorative gifts as a token of our friendship; after that, the representatives from each school provided a brief presentation about each school. Following the ceremony, all the students were divided into small groups and talked about themselves, taking part in several games together. 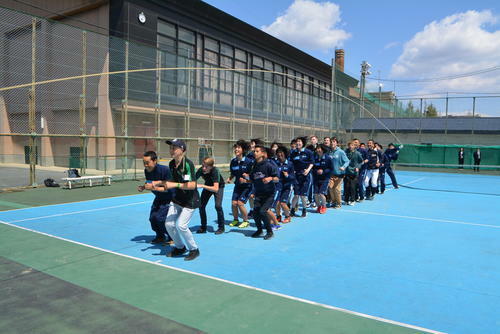 In the fourth period, the second year Sports Course students (Class 2-1 and 2-2) had an exchange program through jumping rope, called "Oh-Nawatobi," in which two people spin a very long rope while many people jump the rope at the same time, trying their best to jump the rope as many times as possible. They made 9 jumps at the end. More Toba students joined the Australian students during the lunch break, and enjoyed conversing with each other while eating lunch together. This exchange program undoubtedly gave a good opportunity to be exposed to something unknown through which they experienced and learned the importance of positive attitude for good communication. The first class of Landscapes of Kyoto and the World for the second year Global Course students was held on April 11 (Th), in which all the students have an opportunity to look at various issues from new perspectives without being bound by the traditional disciplinary boundaries of geography, Japanese History and World History. Today they took part in a workshop. In the workshop, they were required to get some messages from photos of some areas in Japan or the world in terms of geographical features and their historical backgrounds. The first class meeting of Innovation Studies III for the Global Course 3-7 and 3-8 was held on April 11 (W). This year, they are required to write research reports in English, which are based on the researches they did in Innovation Studies II last year. In the first half of the session, the teachers in charge explained what they are going to do in the first semester, and after that, they checked by themselves whether the assignments required during the spring break were complete. In the latter half of the session, they learned the basic skills for writing sentences on the computer. The students are currently at the airport and scheduled to depart on time. The beautiful photos below were taken this evening. This afternoon the students did independent fieldwork on the island of Sentosa. The name of this island, by the way, means "peace and quiet." Today is the final day of the school trip, so tonight the students will depart for Japan and arrive early tomorrow morning. 8 students from Class seven and eight visited HORIBA Instruments Singapore. In addition to learning about the company's activities in the global marketplace, some students gave a presentation about their Innovation Studies group research project. 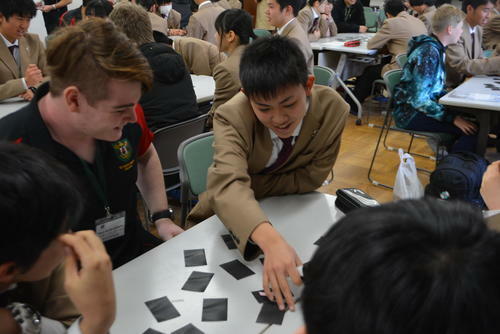 The students also had the opportunity to practice exchanging business cards and using English. Class six visited a company called Leeden NOX. This company deals with gas which is used in many different kinds of manufacturing processes. The company is the largest such company in Japan and the fourth largest in the world. The students could learn many things about the being a successful global enterprise. Today, on the fourth day of the school excursion, each class will be visiting a different local company. Before departing the principal, addressed the students. He told them to listen carefully to what they were told at the company and make the most of this opportunity. In addition to the students fieldwork, the teachers also did fieldwork around Singapore. Below are some of the photos. The photos below show the students during fieldwork. They visited Little India and Chinatown, exploring the different cultures which coexist in Singapore. The students in each group were able to cooperate with and successfully complete the fieldwork. Today, each class and the teachers took photos to remember the trip. Here are a few of the photos below. Today, the students will do fieldwork. They are planning to visit the Merlion Park, Marina Bay Sands Hotel, and Chinatown. The students are staying the "Hard Rock Hotel." It is a large, beautiful hotel with a pool. The all-you-can-eat breakfast is also delicious. This afternoon the Global Course students visited an Islamic School called MADRASAH ALIUNIED AL-ISLAMIAH for an exchange program. At the opening ceremony, 48 students welcomed them with a performance and both schools gave presentations. After that, the students broke up into small groups and participated in a variety of activities, including rock climbing and learning Arabic. It was a wonderful experience the students will never forget. This afternoon, second grade classes two through six visited the Singapore Zoo. This is a large zoo of over 28 hectares with 270 species of animals. One unique feature of the zoo is that animals are not kept in cages and can be seen up close in their natural environment. The students were especially impressed by the famous white tiger. After an all-you-can-eat breakfast, the students took part in the Brothers & Sisters program. Local university students guided small groups of students around the city. The students had the chance to practice their English communication skills while exploring. The second grade students arrived safely in Singapore after a seven-hour flight of some 6500 km. After arriving separately, A Group and Group B had dinner together and then went to the hotel which is on Sentosa Island. Tomorrow, various activities are planned, including the Brothers & Sisters Program, a visit to the Singapore Zoo, and a visit to a local school. Today is the start of the second grade School Excursion to Singapore. A Group, leaving from Kansai International Airport, and B Group, leaving from Chubu International Airport, departed early this morning. They are scheduled to arrive in Singapore at around 5PM local time after a seven hour flight. Today the second grade students attended a special assembly to inaugurate the School Excursion to Singapore, which will take place on Jan. 21 to 25. 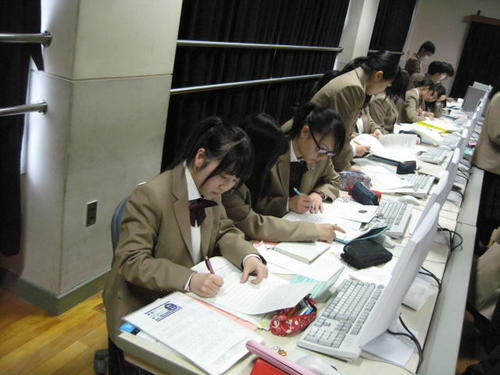 After the accompanying teachers were introduced, they went over the itinerary for the trip. 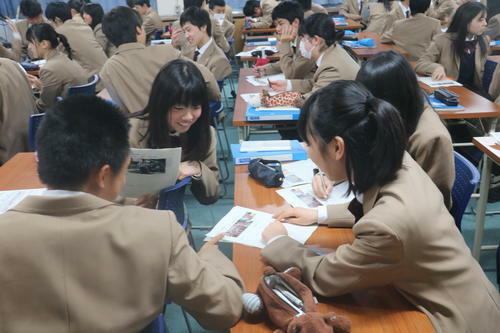 The students aim to "communicate positively with people abroad" during the excursion. The first grade Global Course students participated in a two day overnight seminar at the Ritsumeikan Biwako Kusatsu campus. They worked on the presentations about their Innovation Studies I group research projects, which will be given on Feb. 23. The students were helped by University TAs, who gave them advice on how to improve their presentations. On the second day, they gave a practice version of their planned presentations and got feedback from the TAs. Today the nine students who participated in the Shaanxi Province Visit Program met the Kyoto Prefectural Superintendent of Education. Two students gave a presentation report on the content of the program and what they learned in China. Afterwards, the superintendent asked questions about their experiences and what they learned. 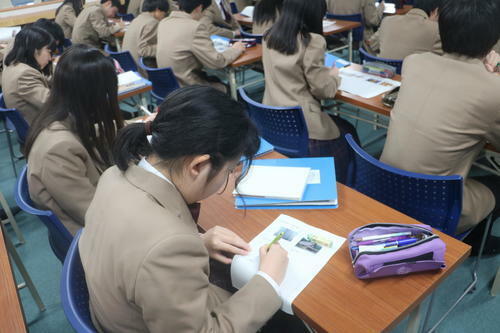 Copyright (C) Kyoto Prefectural Toba High School. All Rights Reserved.